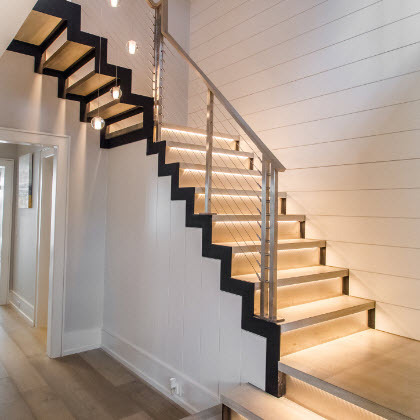 Material and Finish: This Ithaca Style staircase has black powder-coated steel zigzag stringers, 316 stainless steel railing posts and stair risers, and white oak stair treads and top rail. Description: Multi-level modern staircase with Ithaca Style cable railing and zigzag stringers. This custom designed modern staircase by Keuka Studios adds style as well as functionality to this home in Greenwich, Connecticut. It was designed to blend a variety of materials including steel, stainless steel, and wood. The multi-level zigzag stringer is made of powder-coated black steel with 316 stainless steel stair posts and risers. The stair treads and handrail are made of white oak and each step has LED lighting. This floating staircase transcends three stories and still appears lightweight since much of the steel structure was designed to be hidden in the walls and landing.